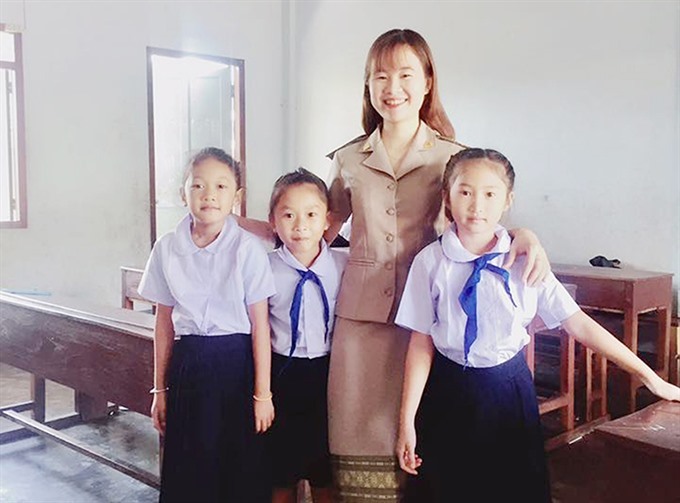 An extract from poet Nguyễn Đình Thi’s Việt Nam - Our Motherland is the first lesson Hoàng Ly Ly, 24, from Cam Lộ District in the central province of Quảng Trị teaches her Vietnamese students in Seno, a small town in Savannakhet Province, Laos. It was a special day when Ly, graduating from Quảng Trị Province’s College of Education with honours more than two years ago, submitted her letter asking to voluntarily teach language and literature for Vietnamese children living in Laos. Ly was sent to Nguyễn Trãi Primary School in Seno Town. The school has 223 students, all Vietnamese. While Lao teachers are in charge of social and natural sciences, Ly teaches them their mother tongue. Ly said that Nguyễn Đình Thi’s words were the best way for students to start building an imaginative bridge with their homeland. She uses music and poems to convey Việt Nam’s landscapes and cultural values to children born and living abroad. With a guitar, she also sings songs from Việt Nam such as the national anthemn and folk songs, along with making traditional dishes and crafts. Vietnamese has been gradually forgotten in the Việt community in Savannakhet Province. Children grow up without understanding their mother tongue which has led to the rapid erosion of traditional values. Nguyễn Thị Tâm, a fourth grader at Nguyễn Trãi Primary School, even asked her grandfather to call Ly and talked to her in Vietnamese so she did not forget even one word. From 2018 to 2019, Quảng Trị Province and Vietnamese People Association in Savannakhet Province will continue their co-operation to bring Vietnamese teachers to Laos. Her luggage this time was much heavier than the first time. Rice, instant noodles, dried fish and candy all made in Việt Nam were presented to Vietnamese people living in Seno and her students.